← 2011 Results are posted! Last year’s race report was published in the March edition of UltraRunning magazine. Note: because this is a running magazine there is little mention of skiing or biking! Tuscobia Winter Ultra – a quick study in becoming race directors! We didn’t exactly plan to become race directors but then how many people do? When we heard in mid-November that the Tuscobia Winter Ultra was cancelled we thought about taking it on for, oh, about 5 minutes. Chris was already signed up the 150 mile adventure and I had planned to volunteer. After a quick polling of interested parties we got a new website set up and re-opened registration within a few days. Luckily the whole intent of the race is to be fairly self-sufficient so we knew we didn’t have to go overboard with the planning. But there are several necessary basics and we wanted to ensure an enjoyable and safe an adventure as possible. With the help of family and friends, we got connected with several members of the Park Falls, WI community which proved essential to a successful race. What we couldn’t predict was the weather! On the day, there was just enough snow still covering the 75-mile Tuscobia State Trail to make it a fun yet challenging event for all who braved the elements. The 150–mile journey started and finished in Park Falls, turning around at the Rice Lake trailhead. The 75-mile started at the turnaround a day later while the 50-km race (renamed the 35-mile by popular demand!) started at Ojibwa. Each distance also had a bike and ski division. Runners in the longer distances typically pull a sled in order to carry the required gear. The ever-changing quality of the snow meant several changes in set-up for some participants. 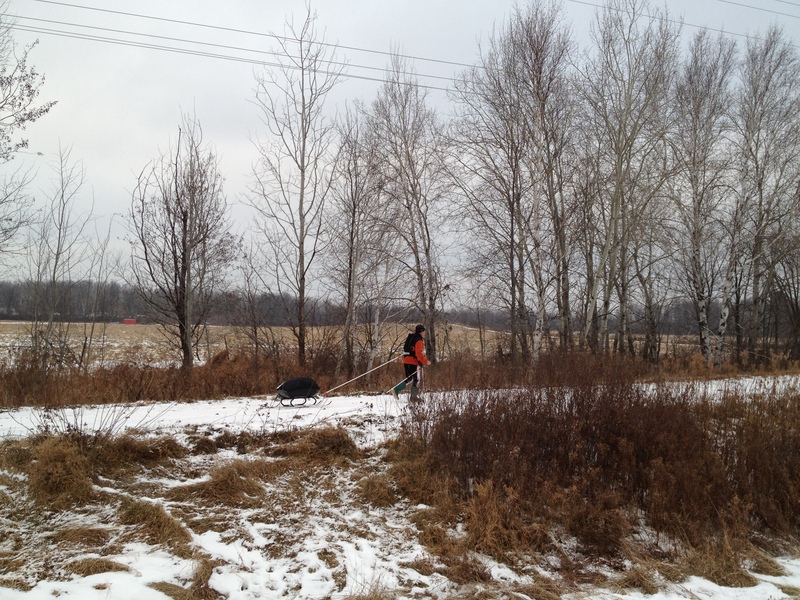 Wheels were added and removed from sleds, ropes and poles were reconfigured, all the while runners continued their forward progress in temperatures that varied between 10 degrees overnight and upper 30’s during the day. Tireless volunteers at the three checkpoints helped participants refuel and replenish their energy reserves over the 3-day event. The warm, welcoming finish line at the Chequamegon Canoe Club in Park Falls was a big hit. Runners shared stories and compared notes on the various tracks they encountered along the sometimes quite remote trail, including wolf, large cat and moose. The Tuscobia Winter Ultra is not for the faint hearted but it is most certainly for anyone seeking adventure in the northwoods!